Fits for most smartphones – Including Apple iPhone 4, 4S, 5, 5S, 5C, 6, 6S, 6 plus, 6S Plus, Blu Advance, BlackBerry Passport, Google Nexus 4, 5, Huawei Ascend Y320, Ascend P7, HTC ONE M8, M7, LG G3, G2, LG Optimus L7 P705, Motorola MOTO G, E, X, Nokia Lumia 520, 521, 530,630, 635, 730, 900, Samsung Galaxy Note 2, 3, 4, Samsung Galaxy S6, S6 edge, S5, S5 Mini, S4, S4 Mini, S3 Mini, Galaxy Tab3, Galaxy S Duos, Sony Xperia M, Z3, Z2, even an iPhone 6 plus with very bulky case such like OtterBox. Adjustable waist band – Fits waist size of 27.5″/70cm – 47.2″/120cm with fully adjustable elastic strap, please refer to the size guide in the second picture and choose carefully before buying. A good designed product for runner, athlete, camper, player, traveler, especially marathon runner. Convenient and Practical – One big pocket has several small compartment inside, providing enough space for cell phones and essentials. Such like smartphone, earphones, Bluetooth headset, car/home keys, cards, cash, wallet, fitness gear, energy gel, chocolate bars, lip gloss, passport, drivers license, chargers, battery packs, and power bank along with you. Snug & Stable – This hydration waist pack is made of soft and lightweight Neoprene, which is water resistant(sweat-proof and rain-proof) and can keep valuables dry. The 5cm width elastic strap and anti-slip inner layers make sure there is no slip, bounce, rubbing, or chafing while running. 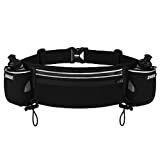 ZIKEE hydration running belt is a small personal item to go hands free and keep belongings safe when doing exercises or just walking. It suits for adults, youth, teens, children. Compatible mobile phones size from 3.5 inches to 7 inches. 1. This product is water resistant, not 100% water proof. To keep your belongings dry, please do not expose it under rainy day for long time. 2. We do not recommend the product directly contact to your skin, the friction of movement may cause skin hurt. 4. Warranty period: One Year Warranty from the date of purchase.